Over the years I've visited quite a few National Parks in southern Queensland and northern New South Wales and it's true to say that each has its own unique character. 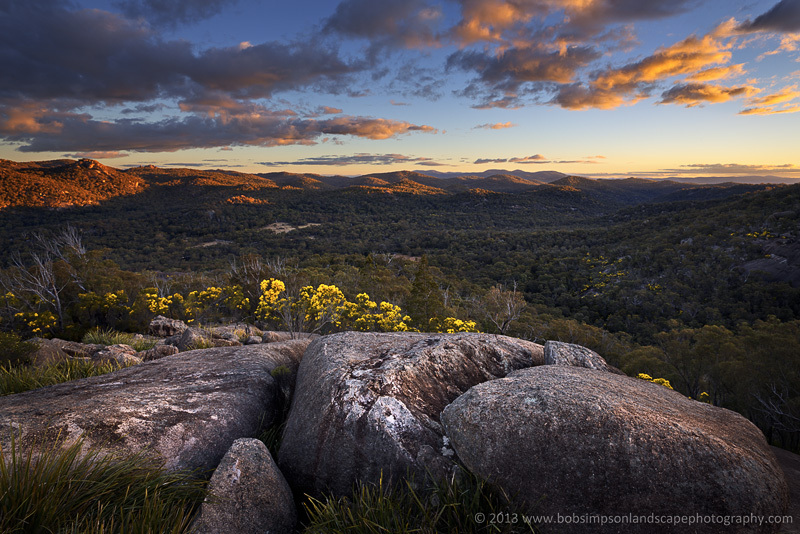 Girraween has been a favourite of mine (and of many others) for its stunning granite landscapes of high, rounded tors and massive boulders, as well as the spring displays of wildflowers. Not far to the west of Girraween lies the less developed and less frequented Sundown National Park with its own hidden treasures. Sundown might be geographically close to Girraween but it is a very different place. 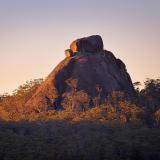 Instead of the seemingly endless granite outcrops of Girraween, Sundown is 'traprock country' - steep gorges and sharp ridges rise from the Severn River which has carved its course through the middle of the park, and woodlands of cypress pine and ironbarks cloak the rocky hills with their distinctive grey-green foliage. This is rough, rugged and isolated country - just the thing for a few days of landscape photography. The Broadwater camping area in the south of the park is the main access point for most visitors. Facilities here are very basic, but you do get a nice flat, grassy pad on which to pitch your tent and easy access to the park's few constructed walking trails. There are other camping areas in the north of the park close to some of the more impressive waterfalls and gorges but they are less accessible by conventional vehicles. So on my most recent trip to Sundown in August 2013, I spent several days in the southern area getting reacquainted with the unique countryside and enjoying the solitude of winter-camping and hiking in a wild landscape. 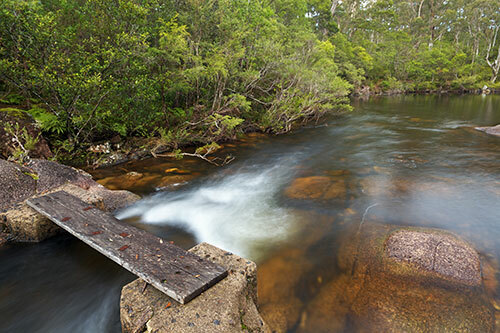 The main centre-piece of the park, the Severn River, flows alongside Broadwater camping area - it's a relatively easy task to explore along the rocky riverbanks for many kilometres upstream as long as you're prepared to get your feet wet. 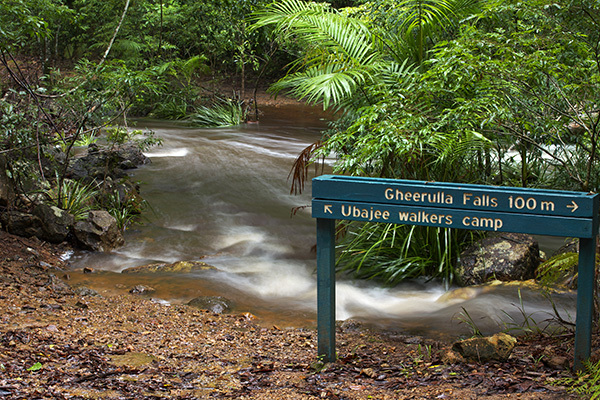 One of the popular wilderness walks in the area involves a 2-3 day trek along the river between the Broadwater and the northern parts of the park. On my first afternoon I took the short 15 minute walk upstream to Permanent Waterhole. The constructed track ends at a rocky outcrop overlooking the deep pool but the afternoon light was more interesting looking back downstream towards the setting sun. The river was mostly in shade but the hills in the background were catching the sun creating a splash of colour and contrast, so I made my way along the bank looking for scenes that included this highlight and its reflection. A polarising filter was helpful for keeping the glary reflections on the water under control but I had to be careful not to over-polarise the sky and create that uneven effect you get when using these filters with a wide angle lens. Early morning at Permanent Waterhole creates a whole new range of photo opportunities - scenes looking upstream become more dramatic and sculptured by the light, and a little morning mist adds mystery and atmosphere. For the first image below, I scrambled up onto a ledge overlooking the pool before dawn and waited for the rolling mist to blanket the background hills. The broken tree at left - maybe a victim of lightning strike - helped to frame the image with its twisted branches, and the lichen-encrusted rocks in the foreground are an ever-present part of the Sundown landscape. After capturing that image, I again made my way downstream along the river, but this time the most interesting light (and my more interesting images) came from looking back upstream towards the rising sun. Shooting into the light like this creates exposure difficulties for any camera, and using graduated neutral density filters to tame the contrast is problematic because of the complex horizon that is broken up by trees and hills. In order to adequately light the foreground and recreate what I saw, I bracketed exposures and blended the best-exposed bits of each in Photoshop to create the final image. One of my aims for this trip was to experiment with star photography. It's something I haven't dabbled in much before but have seen some inspiring results from other photographers around the world. My reading on the subject suggested I needed a dark night (no moon and no city lights) and an early start! The moon set at around 11pm so there was a 5-6 hour window of opportunity before the pre-dawn glow erased many of the stars from view. I aimed for the period around two hours before sunrise to capture the sky at its darkest (and the stars at their brightest) while still allowing some time for sleep. I captured quite a few star scenes over several mornings, experimenting with different combinations of ISO, shutter speed and aperture. The most captivating star images I've seen included some foreground or midground interest rather than just a starry sky, so I tried to find interesting shapes of treetops or hills to give the scene some perspective. 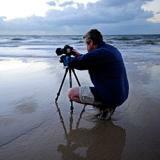 In order to capture the stars as pinpricks of light rather than streaks, the shutter speed needs to be less than 30 seconds, preferably around 20. And in order for a 20 second exposure on a pitch black night to capture enough light to create a viable image requires a wide aperture and a very high ISO. For the image below, I set the aperture to f4 and the ISO to 6400, then counted off my exposure to 23 seconds. 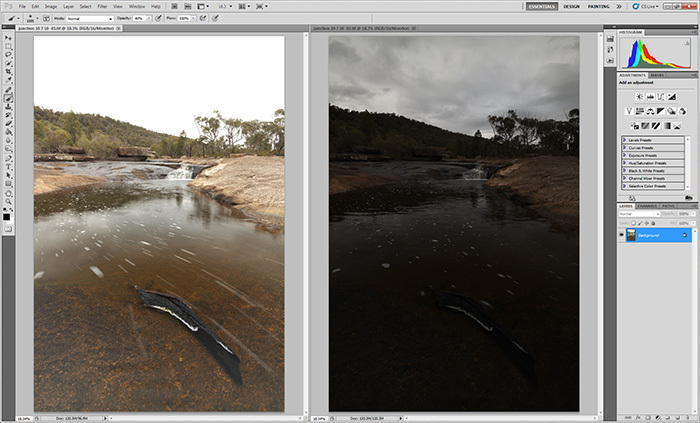 Even at these settings, the image was quite dark and had to be lightened in Photoshop. An ISO of 6400 creates a very noisy digital image. This can be cleaned up somewhat with noise reduction software but the final image will never be as clean and sharp as one taken at a low ISO. 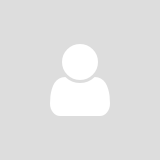 This seems to be unavoidable, although I've briefly read about (but not yet investigated) techniques to minimise this problem - more research on my part needed! With the noise issue in mind, I captured a second much longer exposure at ISO400 while painting light onto the tree with my torch - this produced a much cleaner image of the tree but also rendered the stars as streaks. The final image above is a blend of the two exposures. 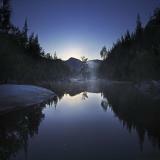 This 5km trail takes you away from the river and up onto a ridge at the western boundary of Sundown National Park. A well placed bench-seat at the top of the trail offers a welcome rest and great views down into the heart of Sundown. The dead ironbark tree in my star shot above is right beside the walking track. Being a relatively short walk, this is a good spot to target for a sunrise photo session. It takes around 40 minutes to climb to the top of the trail from the camping area, but the track is easy to follow by torchlight and not too steep. I'm sure it could also be productive at sunset with the light behind you, but sunrise will produce a more dramatic scene as the sun rises over the wooded hills to the east. There are also views over rolling farmland to the west but a high boundary fence makes it difficult to get a clear shot in that direction. From this high point, the trail descends through ironbark woodland and down onto a broad grassland populated by grey kangaroos. This area has evidence of past mining and pastoral activities and I suspect the grassland was created, at least in part, by clearing in the late 1800s / early 1900s. Natural or not, it is a beautiful part of the circuit trail with steep-sided hills framing the view - and the bonus when I visited of so many joeys peering out of mother-kangaroos' pouches. I don't take a lot of wildlife images but when the subjects sit so quietly and pose like this it's impossible to resist. People who know Sundown National Park well will know that I've barely touched the surface of what it has to offer. I have to admit, I came away feeling the same way. Four days of exploring the rocky landscape gave me new insights into what makes Sundown tick, but it raised just as many questions in my mind and lit the fire for a return visit. Like all wild places, it takes time to scratch the surface and see past the obvious. The same applies to photographing any area like this - a first visit may well result in good images of the features and scenes that immediately take your eye, but a deeper understanding of the local landscape raises new possibilities and options. That's why I spent a good portion of the five hour drive home thinking about where I'd go and what I'd photograph next time I visit Sundown. It's another case of unfinished business!